From that great expanse of land to our north, SWAC area friends continue their trip across Alaska, sending dispatches with exciting news about the places they've visited. After driving cross-country to Washington, they boarded a ferry that took them to Ketchikan and, after a few days there, they are now in Juneau. Thirty minutes out of Ketchikan yesterday we had to turn back because one of the crew had a minor medical emergency. The ambulance was waiting for us, so we had 1 1/2 hr. delay but still got to Juneau early. Those diesels engines made up good time. This ferry was smaller but still had all that the bigger one offers. We liked it better -- less people and decks to get lost on. Ketchikan is a small town nestled between the water and mountains. Industry is tourism and fishing, and 3 trillion boats and sea planes are here, I believe! We had 3 delightful warm sunny days which they tell us is not normal. We hiked in the rain forest, walked 3 miles out to the Totem Center, caught bus back, did the fjords tour that we already had planned. We stayed in the historic district along a white water creek, watched salmon making their way up stream to spawn, 4 harbor seals trying to catch them. It runs through town so we walked a lot beside it. Our hotel was old but quaint, period furnishings, nice linens and clean, nestled up against a big hill and had 2 small court yards. We enjoyed it a lot. Our front windows overlooked the harbor. We watched guys catching those salmon and we could lie in bed and watch the fish jump, schools of them -- fun to watch. Also had 2 eagles that came every evening. Around the corner from our hotel, Creek Street, was a street of brothels from the early 1900's until the fifties. Hey, there weren't any women up here. A guy's got to have some fun, for 2 bits, high price since they only made 53 cents an hour. LOL. Tomorrow we start our Juneau walkabout to see what's here. Looks nice so far. Having a great experience learning about our 50th state or is the 57th, like O, tired -- can't remember. God speed as they continue their journey. Live ... "A Shining Light Across America" ... Happy 100th Birthday, BSA! If you tune in now through 10 pm ... live from Ft. A.P. Hill in Virginia ... the Boy Scout Jamboree is celebrating the 100th birthday of the BSA. The arena is jam-packed with 100,000 people on a cool Virginia night while thousands more Boy Scouts are featured live from NY's Times Square, Durham "Bulls" Stadium in NC, and from the Black Hills of ND. Televised live and carried through the Brigham Young channel (BYU TV), the program is being beamed across the nation as "A Shining Light Across America" showcasing the power of Scouting ... the big, bold learning and leadership that began in 1916. Scouts are able to do things that other kids their age never dreamed possible and they were taught honor and respect. The opening ceremony featured a flag that had flown on 9/11 beside the Twin Towers, a live American eagle on stage, a brief history of the flag, and the singing of the National Anthem as tens of thousands of Scouts stood at attention while saluting the flag. They recognized and honored the branches of the military, and then chants of "USA," "USA," "USA" echoed throughout the huge crowd while fireworks boomed overhead. The fun is continuing with entertainment and MCs made up of Boys Scouts themselves as they continue to be "A Shining Light Across America." Right now Mike Rowe from Discovery Channel's "Dirty Jobs," an Eagle Scout in his youth, is on stage. Tune in ... it's patriotic and heart-warming. 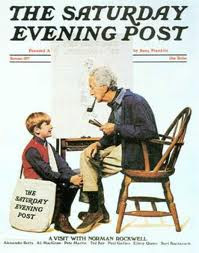 Past Boy Scouts are encouraged to check out http://www.bsaalumni.com/ and get back in touch. Update 8:40: Mike Rowe is really interesting as he talks about his Scouting experiences and how it helps encourage boys beyond their comfort zones while learning and achieving. He's laughingly lobbying the guys to get a "Dirty Jobs" BSA patch. After a 15-minute conversation with the boys in which he shared that he was a shy kid who studdered when he was nervous, he concluded by saying he would not be anywhere without the Boy Scouts of America. Update 9:25: A preview was shown of the 4,000-acre West Virginia location of future Scout Jamborees called The Summit. It's supposed to be ready by the next Jamboree in 2013. Update 9:50: Taped birthday greetings were offered from former Boy Scouts including from country singer Josh Turner, NASCAR owner Joe Gibbs, entertainer Jerry Fader, magician Nathan Burton, comedian John Reep, bobsled gold medalist Steve Holcomb, and others. Entertainment now by the Christian rock band Switchfoot, chosen by the Scouts themselves to sing for the event. The lead singer and his brother, the bass guitar player, were Boy Scouts when they were younger. Lead singer commented, "It's good to see so many faces out there ... faces of the next generation of America." Update 10:15: Thanks are being offered to volunteers who worked the past four years preparing for the 100th anniversary Jamboree including executives from AT&T and Exxon. As with all groups, volunteers are the heart of an organization and that includes the Boy Scouts. Vocal Point is now singing "around the campfire" as the production is coming to a close. Now one boy with a torch representing each point in the Boy Scout Oath is coming into the stadium. From the campfire comes the dedication for the next 100 years ... every Scout has a candle that is being lit by the torches ... after all were lit, they recited the Boy Scout oath. Update 10:25: Fireworks are now closing out the program. July 31st ... Happy birthday to SWAC Husband and may he have many more. As I travel throughout the 6th Congressional District, meeting with my constituents, I consistently hear concerns about the out-of-control government spending that is going on in Washington. The majority of my constituents rightly know that in these challenging economic times it is even more important for government to control spending. However, this is a principle that has been lost on the Majority in Congress. They have increased federal spending at an unsustainable pace, spending billions of dollars on wasteful projects in failed attempts to grow our economy. One particularly egregious waste of taxpayer dollars is right here in southwestern Virginia. Just over a year ago, it was announced that nearly $51 million of the taxpayer’s money would be spent to increase the energy efficiencies of the Richard H. Poff Federal Building in downtown Roanoke. I have received numerous inquiries from constituents concerned about the excessive price tag for the project, the cost effectiveness of this project relative to alternative construction, and the inability of local businesses to bid on the initial stages of the project. Recently the primary construction contract was issued to an out of the area company. Since that time I have aggressively sought answers from the GSA regarding the cost and scope of this wasteful and misguided project and called on General Services Administration (GSA) and the Government Accountability Office (GAO) to investigate this matter. I am particularly concerned about the lack of a thorough cost-benefit analysis of the renovation and failure to include security improvements to the building in the project’s plans. Recently I learned that the United States District Court for the Western District of Virginia, one of the largest employers in the Poff Building, had requested that GSA examine alternatives to the renovation of the Poff Building for security and efficiency reasons and was refused. Our federal district courts have many controversial criminal and civil trials and security must be a top priority. Additionally, I have strong concerns about the significant impact of the renovation on the tenants of the Poff Building. It has come to my attention that the Department of Veterans Affairs (VA) Roanoke Regional Office will be moved to four different locations. Not only will this be difficult for the employees of the VA Roanoke Regional Office but it will cause an increase in already lengthy delays in processing veterans’ claims and place an unnecessary burden on our area veterans when they are seeking assistance from the Department of Veterans Affairs. How can GSA spend nearly $51 million of the taxpayers’ money to renovate the Poff Federal Building and yet not address the needs of the building’s tenants? Recently Senators Warner and Webb, recognizing that this project is ill-conceived, wrote to the Secretary of Veterans Affairs and the Administrator of GSA suggesting that the Poff building renovation be halted. The path to our economic recovery starts with fiscal responsibility in Washington and that’s why I have strongly urged GSA to immediately halt the wasteful and misguided renovation of the Poff Federal Building. I will continue working to see that a thorough investigation into this matter is completed. We must ensure that any improvements made to the Poff Federal Building will be beneficial to the taxpayers, the federal government, and the Poff Building tenants. It's a nice, cool morning in the Shenandoah Valley ... overcast, overnight temp around 60 degrees, lower humidity. We're enjoying a welcome break from the high heat of July. As I grab a few minutes of computer time before heading out to meet friends for breakfast, I am amused at the small "social" world we live in these days. My neighbor about two miles up the road was on Facebook and we "talked" back and forth ... too funny. I left birthday greetings on USMC Sgt. Nate Salatin's Facebook page since this is his special day, and responded to several friends who had left messages on my page. Along the wind-swept sand dunes of Virginia's barrier island of Assateague in the Atlantic Ocean, the wild ponies roam as they have for hundreds of years. On Wednesday, however, they were being herded up for the annual swim across the channel to Chincoteague. In 1925, Chincoteague Volunteer Fire Department decided to round up the ponies and auction off some to help buy badly needed fire equipment. At the same time, it would help control the size of the herd on the fragile barrier island environment. The event, in conjunction with the firemen's carnival, was so successful that it became an annual event, reguarly drawing 40,000 spectators to watch the 150-175 ponies plunge in for the five-minute swim across Assateague Channel. On Wednesday the tradition continued sometime between 10:30 and noon when the "slack" tide will make it easiest for young foals born in the spring to ford the channel. The first colt to make it to shore after the swim was tagged to be given away to a lucky winner at the carnival. The event gained international attention in 1947 when local resident Marguerite Henry wrote the famous children's novel, "Misty of Chincoteague," a true story of a young brother and sister who grew up on Chincotague and raised money by selling clams so they could purchase "Misty," a young colt with markings on her side resembling a map of the United States. Millions of visitors have since visited the area to see the ponies and the islands. The movie, "Misty," brought even more attention to the pony swim, an event that continues to be popular with tourists, residents of the island, and receives national television coverage. The event is always held the fourth Wednesday in July. Will the Obama White House never learn? After another dust-up between White House spokesman Robert Gibbs and conservative talk radio giant Rush Limbaugh, Gibbs was left sounding weak and vindictive. This is just the latest attack on Rush from the Obama crew. Don't they get it? Don't they know that all they do is call attention to Rush, raise his image in the eyes of the public, and make themselves look silly? The office of the President of the United States has, in the past, been above going after media personalities and, indeed, media outlets such as Fox News that has also been attacked by this President. There is a decorum that is expected from those in leadership that is diminished if they get into slug-fests with their critics. Via Allahpundit at Hot Air, the new Time magazine cover with a photo of a woman whose nose was cut off by the Taliban. But that's not all the horror she suffered. Check it out. For those who live in the Sears Hill neighborhood overlooking Staunton, a century-old historic iron pedestrian footbridge over the railroad tracks is an important connection to downtown and the train station. When the bridge was closed seven months ago because of safety issues due to age and deterioration, Sears Hill was isolated by the steep drop to the railroad tracks below, and residents had to access the downtown area by one of the streets off the small urban mountain. While city officials wrangled with the bridge's owner about what to do and who would pay, Stauntonians wanted it repaired and reopened. Estimates of the cost were reported to be anywhere from $100,000 to $250,000 at a time when the city was feeling the pinch of difficult financial times. According to WHSV TV-3, Deputy City Manager Jim Halasz commented, "The city was not really prepared to look at this type of an expense. We have done our best to work with [bridge owner], and I think he has done the same. Luckily, we have interested community members who we think are going to assist in this project." An agreement was finally reached Tuesday between bridge owner and Roanoke businessman Richard Macher of MH Staunton, the City of Staunton, the Historic Preservation Commission, and citizens interested in seeing the structure restored. The bridge's current owner, MH Staunton LLC, agreed to pay for the cost of removing the bridge as part of a $20,000 contribution to the project. City council has agreed to match the $20,000 as seed money to get the project started, Deputy City Manager James Halasz told the Historic Preservation Commission on Wednesday. Commission chairman David Brown said he'd already seen substantial interest from the community and the private sector to help finance the project. The bridge is listed on the National Register of Historic Places in a city that respects her historical heritage. Sears Hill is part of that heritage. Sears Hill was named for Dr. Barnas Sears who lived in the Sears House from 1867-1880. A bracketed cottage popularized in America by Andrew Jackson Downing, it is located at the top of the steep hill and was built to overlook downtown Staunton although large shade trees now block the summer view. Dr. Sears, president of Brown University from 1855-1867, was a prominent educator who was chosen by George Peabody of Massachusetts to distribute scholarships from his $3,500,000 Peabody Fund to promote "intellectual, moral, or industrial education among the young of the Southern and Southwestern States of our Union," reported to be the basis of free schooling throughout the post-Civil War South. To do this, Dr. Sears based himself in Staunton where he lived until his death. His house still stands and is under renovation, part of the rich architectural heritage of the central Shenandoah Valley. American Safety Razor Company (ASR) has certainly been in the news the past six months, first with $2 million in marijuana arriving in a shipment, then with news that a former purchasing director was charged with embezzling $750,000 from the company, and the latest news today announcing they have filed for bankruptcy. The New Jersey-based ASR, one of the world's largest manufacturers and distributors of wet shaving razors and blades, entered Chapter 11 in the U.S. Bankruptcy Court in Delaware and has proposed selling itself to first-lien lenders pending higher offers from second-lien lenders, according to a Wednesday ASR press release. Company officials were tight-lipped about the latest news. I'm not sure whether this says more about Republicans versus Democrats, or if it's one young lady's vision of the ideal wedding versus another, or if it's a difference in upbringing and backgrounds. Jenna Bush got married in 2008 (to Virginian Henry Hager) at her parents' ranch in Crawford. Her father was the current Republican President of the United States. Cost of her wedding: reportedly $100,000. Chelsea Clinton is supposedly getting married this weekend at a rented/borrowed estate in New York state. Her father is the former Democratic President of the United States. Cost of her wedding: reportedly $3-5 million. With a claim that Republicans have a Contract On America, and addressing an imaginary group called the "Republican Tea Party," Democrats rolled out their latest attack on both the GOP and tea parties. Hello ... Mr. Kaine..." Oh, never mind. Don't let the facts get in your way of pushing an ever increasing liberal agenda. Now comes news that Shirley Sherrod plans to sue Andrew Breitbart. Did anyone doubt it? Rep. Tom Perriello (D-VA 5th) has only served one term in the U.S. Congress but his votes over the past 18 months have put him at odds with many of his constituents. While the Democrats who dominate the Fifth District's urban Charlottesville area are probably happy with his record, constituents in the rural areas are hopping mad that he has broken campaign promise after campaign promise made while running against former Representative Virgil Goode. RPV has a new video to highlight Perriello's promises. He promised to bring change to the 5th District. He promised to change health care while improving Medicare and reducing the deficit. He promised to change the way the 5th District pays taxes by lowering their tax burden. Rep. Perriello certainly has brought change to the 5th District ... just not the kind he promised. He did change heath care, by limiting access to doctors, raising the federal deficit, and levying the first ever tax on simply being alive. And Rep. Perriello is about to change the tax burden for middle class families ... even Steny Hoyer is talking about raising taxes on middle class families to help balance the whopping $13 trillion budget. Perriello himself said just Wednesday that he wants to see the tax cuts of 2001 and 2003 expire. But then again, what else can you expect from someone who votes with Nancy Pelosi 90 percent of the time? That’s why RPV has released a new web video “Change?” which highlights some of the "changes" Tom Perriello has been a part of this year. November can’t get here soon enough so the voters in the 5th District can properly thank Tom Perriello — by giving him his pink slip. The next "change" Tom Perriello needs to make is a change of occupation. Even as President Barack Obama and his administration continue to bash former President George W. Bush at every opportunity, new poll numbers reveal his base has moved beyond that and is actually aware that Obama is the one in charge. This in light of polls also increasingly pointing to a "thumping" for Democrats in November, as noted by the Washington Examiner's Michael Barone. Could Republicans take over the U.S. House of Representatives? Will fireworks fly at tonight's Augusta BoS meeting? After what was reported to be a contentious exchange at Monday's Augusta County Board of Supervisors staff briefing between supervisors Tracy Pyles (D-Pastures) and David Beyeler (R-South River), tonight's public meeting may spark some fireworks. The issue is staggered terms for supervisors, an idea Mr. Pyles supports and Mr. Beyeler does not. Augusta County supervisor Tracy Pyles seeks clearance from fellow supervisors tonight to use the services of County Attorney Patrick Morgan in reviewing his staggered terms petitions. Pyles wants to use petitions to get the necessary voters signed to bring his idea for staggered supervisor terms to a referendum. But he has been advised to seek a legal opinion on whether the petition complies with the Virginia Code. There are other interesting agenda items tonight. The public is invited and encouraged to attend at 7:00 p.m. at the Government Center located on Rt. 11 in Verona. The Daily Caller has published still more excerpts from the left-wing journalism chat room JournoList. This time the theme is “Heroes of JournoList.” The phrase refers to lefty journalists who on at least one occasion overcame their ideology to defy the conventional wisdom of JournoList’s 400 participants. And what qualifies as heroism on JournoList? Update: NAACP denounces Jim Webb's comments. Friday's Wall Street Journal had an op-ed piece by Sen. Jim Webb (D-VA) that had some scratching their heads while others agreed. Writing for the op-ed page of The Wall Street Journal this past Friday, Virginia's senior senator proposed junking federal anti-discrimination programs. Webb argues that they have strayed "so far beyond their original purpose that they now favor anyone who does not happen to be white." Webb says programs that were a response in the 1960s to centuries-old, government-sanctioned prejudice against blacks have morphed into protections for all people of color, including newly arrived Asian and Latin immigrants, moving "affirmative action away from remediation and toward discrimination, this time against whites." Such views would seem wildly heretical for a Democrat, and dangerously impolitic, particularly for a Democrat who underperformed with black voters in his improbable victory over George Allen in 2006 -- a triumph too easily attributed to public revulsion over the perceived racial slur Allen directed at an Indian-American working for Webb. In an op-ed for the Wall Street Journal, Webb put to rest the myth of white dominance that has "served as the whipping post for almost every debate about power and status in America." Because of government-sponsored "diversity" policies, he wrote, white workers have become marginalized to serve an overbroad effort to make up for past wrongs. Webb rightly notes that the old South was a three-tiered society, "with blacks and hard-put whites both dominated by white elites who manipulated racial tensions in order to maintain power." He might have added that white elites used populist rhetoric to keep an entire third of the region's population disenfranchised, in effect also making the Southern economy "backward." Webb's argument is rooted in a genuine desire to get past the "gotcha" politics of race and the unintended consequences of racial guilt. With luck and good sense, the nation will follow suit. A friend commented, "Game changer?" Good question. I'm back in the Valley after spending the past week with my folks in Richmond ... hot, humid days in the flat lands ... days that saw 100, 101, even 105 degrees as they broke a record for the most 100-degree days in a year. It was great to be with everyone ... my sister and I spent a lot of time together ... we drove to pick up SWAC Niece from camp in NC last weekend and then spent time with her. But today, on an overcast rainy day, I pointed my vehicle west ... my destination was the Blue Ridge Mountains and Shenandoah Valley. After leaving my parents' home, I made a quick stop at Martin's/Ukrop's to get the "Ukrop's Fix" for my family including paninis and chicken salad, and once again put in a plea asking that they stock favored items in Valley Martin's stores, and then hit the road where I ran through rain just west of Richmond and then out of it by Charlottesville. I was accompanied on the drive back by Rush Limbaugh on the radio ... I-64 had light traffic which made for easy driving. As I approached Afton, the rain began again, first as mist and then heavier, and the fog lights were on. Sure enough, as my vehicle climbed the mountain, the fog got thicker and thicker until it completely shrouded me in white as I passed under the Skyline Drive at the top. On the western slope, dropping down into the Valley, the fog finally began to lift and my cell phone rang. As John Denver once said, "Hey, it's good to be back home again...."
One U.S. sailor has been killed and another is being held captive by the Taliban in Afghanistan, according to reports. The Taliban's claim to have captured the sailor taunted that he was being held in a location where he would not be found. With a timeline in place of summer 2011 to withdraw troops from the war-torn country, American troops are in more danger than before as alliances break down from those who realize the U.S. will not be there after next year to have their backs. Had an email this morning from friends who are in Alaska ... they're having a great time in cooler weather. Summer 1971 edition of "The Saturday Evening Post." I've been visiting my folks in Richmond the past week, spending time with my sister. Mom pulled out some things for us to go through to see if we were interested in any of it including a stack of old books and magazines. I am now in the possession of a Summer 1971 edition of The Saturday Evening Post featuring an interview with Norman Rockwell, the artist whose illustrations made The Post what it was. He was 79 years young at the time of the interview. The cover price in 1971 ... one dollar. To me ... priceless. "If Republicans take back Congress they'll implement a truly dangerous agenda," Franken told the Netroots Nation gathering in Las Vegas. "Everything is on the table from repealing healthcare reform to privatizing Social Security." First, he was addressing the Netroots Nation gathering. 'Nuff said. Second, I have to wonder what part of the Obama agenda has not been considered dangerous to Americans who believe in hard work, working hard and paying their own way, helping a neighbor, following the Constitution and the vision of our Founding Fathers, and a love of America. As one person commented, "The people have screamed no and the Dems say go! Now the voters will speak." RICHMOND - The Governor’s Commission on Economic Development and Job Creation held its second full meeting today at J. Sargeant Reynolds Community College in Richmond. The Commission is led by Lieutenant Governor and Chief Jobs Creation Officer Bill Bolling and the Governor’s Senior Economic Advisor Bob Sledd. The Governor and Lieutenant Governor have charged the Commission with developing a series of innovative, achievable policy recommendations to help create jobs and stimulate economic growth in Virginia. During today’s meeting the Commission presented an interim report executive summary. Over the past two months the Commission has developed strategies and initial policy recommendations to better position Virginia to create jobs and grow the economy. Its nine subgroups have been analyzing Virginia’s economic development programs and agencies; assessing competitive initiatives in other states; considering existing tax and regulatory impediments to job creation; and, engaging private sector and state and local government stakeholders. Lieutenant Governor Bolling added, “The Governor's Commission on Economic Development and Job Creation is primarily responsible for helping us develop part two of our Jobs and Opportunity Agenda. Their recommendations are very important to helping us decide what additional improvements and investments we need to make in our current economic development programs to make certain that we do everything we can to get Virginia’s economy moving again." · Virginia’s effective existing economic development programs and incentives have been disproportionally affected by budget reductions during previous Administrations. · Several key industries such as tourism, small business and emerging technologies have historically lacked the attention, resources and tools commensurate with their return on investment, value to Virginia’s economy and capacity to create jobs. · Virginia’s tax structure affects some businesses unevenly and unfairly, stifles economic growth and job creation and perpetuates competitive disadvantages in key industries. · While Virginia boasts the best higher education system in America, the economic development and workforce development potential of our four-year colleges and universities’ and community colleges is severely underutilized. · Entrepreneurs continue to face significant permitting, resource and capital challenges to starting, running and expanding a business in Virginia. Below is an overview of common themes and key initial recommendations of the more than 115 strategies and recommendations under consideration by the Commission and its subgroups. Interim report recommendations are not final and may not ultimately be endorsed by the Commission or the Administration. The interim update is designed to provide the Commission leadership, Commission members, interested parties and the general public with a progress report on activities to date. Over the next two months, strategies and recommendations included in the interim report will be further developed, researched, distilled and prioritized prior to consideration for the Commission’s final report to Governor McDonnell in October. Additional initiatives beyond those included in the interim report may also be considered for the final report. The final recommendations of the Jobs Commission will be those innovative, achievable initiatives that provide the highest return on investment, advance strategic economic development initiatives of the McDonnell Administration, and best position Virginia business and industry to create jobs and economic opportunity for all Virginians. Tourism Development Fund – Tourism is a proven economic development and job creation driver that can inject additional state and local tax revenue into Virginia’s economy more quickly than any other industry. However, Virginia has significant tourism product deficiencies that affect our ability to attract new and repeat visitors and extend their length of stay. Whether a bed & breakfast in the wine country, a convention hotel in Williamsburg or an entertainment center in Virginia Beach, product needs exist in all regions of Virginia. Unlike most major industries in Virginia, tourism does not enjoy tax incentives, grant programs or a dedicated funding mechanism for product development. The Tourism Subgroup recommends the creation of a Tourism Development Fund designed to provide gap financing for locally endorsed and supported tourism projects – small and large, rural and urban – through grants, loans, loan guarantees, bonds or other funding mechanisms. The Fund will require a state, local and private sector partnership, be self-sustaining, not divert funds from any existing programs and ultimately have no net impact on the General Fund. Emerging Technologies Fund - Virginia must provide the incentives that have a targeted return on investment, but also benefit companies that can be encouraged to expand in Virginia. An incentive structure that supports traditional “bread and butter” projects for which Virginia competes is needed, and in addition, there is an interest in an Emerging Technologies Fund, similar to a program in Texas, providing flexibility in incentive opportunities as it relates to quickly evolving technologies – addressing small, medium and large businesses. An Emerging Technologies Fund could help fill a critical strategic gap in Virginia’s current array of business incentives. · Research Superiority Acquisition Grants (provide source of funds for bringing the best and brightest researchers). Job Creating Tax Reform – In an environment where the competition for jobs and new investment grows more intense every day, Virginia must constantly review its tax policies to maintain its competitive edge and effectively respond to actions taken by other states and countries. Virginia’s current tax structure is burdensome, affects some businesses unevenly and unfairly, while stifling growth, discouraging job creation and perpetuating competitive disadvantages in key industries. Commission members have identified the BPOL and Machinery and Tools as taxes that are particularly unfair, burdensome and prohibitive to business expansion and job creation and changes to the corporate income tax as an opportunity to potentially stimulate significant economic growth. Working with industry, state and local government stakeholders, the Commission will continue to consider strategies to ensure these burdensome taxes do not stifle economic growth and job creation. Other job creating tax reforms including making changes between the three methods of corporate income taxation easier and expediting the allowance of the single sales factor election for manufacturers. Transforming Academic Institutions into Economic Engines – While Virginia has the best higher education system in America, our colleges and universities’ economic development potential is severely underutilized. The Commission subgroups believe that our universities’ research and development capabilities and collaboration with the private sector are deficient and recognize the need to make fundamental changes in how we disseminate information on our institutions of higher education excellence. · Refundable R&D tax credit targeted at advance technology companies that sponsor research at Virginia universities. Small Business/Startup Business Capital Access – Capital access is consistently cited as the biggest challenge for small business growth and new business development. The Commission subgroups recommend the creation of Small Business Investment Tax Credit/Venture Virginia capital access program. The program may include provisions to provide tax credits to investors who make capital investment in certified small businesses or venture capital investment in targeted industries such as bio-technology or life sciences. Funds could also be generated through tax credits to insurance companies that expedite payment of their state taxes. Entrepreneur Expressway – Too often government creates a complicated path of regulatory roadblocks for entrepreneurs to start or expand their business. Compared to other benchmark states, Virginia had the 2nd lowest level of entrepreneurs per capita in 2005. Government should provide expressways, not roadblocks, to entrepreneurs trying to start or expand their business. · Develop systems and resources to better communicate regulatory and legislative changes to small businesses and entrepreneurs that affect their businesses. Training Workers for Virginia Businesses – For existing businesses to expand and new businesses to grow and locate in Virginia, they must be able to find the skilled workers to meet their company’s needs. The Commission subgroups believe that Virginia’s workforce development programs must be more streamlined, coordinated with community colleges and existing businesses and focused on training workers to meet the existing and future needs of existing businesses and target industries in their communities. · Promote and report on workplace-oriented education and training including increased enrollment in high school programs leading to technical and advanced technical diplomas. On Thursday, Rep. Eric Cantor made news with his decision to remain independent of Rep. Michelle Bachmann's (R-MN) tea party caucus in the U.S. House of Representatives . "Part of what is so inspiring about the Tea-Party movement is that it is not structured like a political party and, instead, is a truly organic, grass-roots effort. The movement was born outside of Washington and includes people of all political stripes -- Republicans, independents, and Democrats -- who have come together out of frustration with their government in an effort to force it to change . . . .The millions of Americans who are part of the Tea-Party movement will no doubt have a major voice this fall when the bad policies of the past two years come up for review." The tea party movement appears to primarily be a fiscally concerned group of citizens who are worried about the deep debt our country faces in light of controversial legislation that has been spearheaded by Democratic President Barack Obama and passed by the Democratic-controlled U.S. Senate and House of Representatives. That concern encompasses Democrats, Independents, Constitution Party, Green Party, Ron Paul supporters, and others upset with massive spending and taxes involved with cap-and-trade, bank bailouts, the stimulus bill, auto company bailouts, and the mammoth government health care bill. In other words, the tea party is not made up of just Republicans or social conservatives. The common denominator for all is fiscal conservatism. Beyond that, there are significant differences. Some within the ranks are 9/11 "truthers," "birthers," and those calling for states to secede from the U.S.
Institutional issues also argue in favor of Cantor's position. As the GOP's whip (and its majority leader if the party wins a majority in November), he must not be seen as part of any ideological faction. His viability and success depend on his ability to forge close relations with Republicans of diverse philosophical inclinations. There is nothing wrong with joining caucuses based on geography or interest, but Cantor would court difficulties if he formally aligned himself with a movement that has challenged GOP incumbents in primaries. The GOP is also better off if it forgoes any attempt to merge with the tea party movement. The GOP cannot possibly hope to control the dynamics of the highly decentralized galaxy of groups that make up the tea party movement. There will be troubling excesses and these will hurt Republicans if the party is formally associated with tea party groups. The Republican Party and the tea party movement have many common interests right now. But they are, and should remain, distinct from one another. This is one instance when, if they merged, the sum would be less than the parts. The Times-Dispatch agreed. "Cantor," they wrote, " ... has made the prudent call. Blogging and China seem to be oxymorons ... but Chinese blogger Han Han appears to have found a way to work within the system while getting the message out. NBC-29 covered Saturday's Fluvanna County Board of Supervisors retreat to discuss issues of importance to the county. Look closely ... a familiar blogging face is among those attending. Governor Bob McDonnell returns to NBC12 First at 4 on Friday from a unique location. The Governor is in the midst of his first foreign trade mission and will join us live from Frankfurt, Germany. McDonnell has already made stops in the United Kingdom and the Netherlands before arriving in Germany. The focus of the Governor’s trip is to encourage European business in Virginia, specifically in the areas of aviation, wine and tourism. He is joined on the trip by First Lady Maureen McDonnell and Secretary of Commerce and Trade Jim Cheng. Today the Governor held a conference call with the Virginia media where he discussed the progress he has made on the trip to this point. Friday he talks with us on NBC12 one on one. You can see First at 4 on NBC12-TV and streamed live on NBC12.com. In the summer of 2009, when popular five-term Del. Chris Saxman (R-20th House) unexpectedly decided to retire from the Virginia House of Delegates during his reelection campaign, long-time Staunton City Councilman Dickie Bell was tapped to run as the Republican candidate. Caught off guard at the sudden opportunity but rising to the occasion, the future seemed bright for this special education teacher in the Augusta County public school system located in the central Shenandoah Valley. He handily won his election with 71% of the vote during the history-making 2009 election that saw Republican candidates sweep the top three spots of governor, lieutenant governor, and attorney general. Getting time off from school to attend the 2010 General Assembly in January and February became somewhat of an issue with the school system but was eventually resolved when he was granted unpaid leave. Part of the agreement, Bell thought, was the additional days necessary for all legislators who have committee meetings scheduled throughout the year in Richmond. Bell is hardly unique in holding a teaching job while serving as a representative. The Virginia General Assembly includes a college professor, an education administrator, four currently-employed teachers, and two retired educators. Former Rockingham Sen. Kevin Miller taught at James Madison University while representing that area of the Shenandoah Valley. Now comes news that Del. Bell has announced his retirement from the Augusta County public school system because he was not able to obtain the days off beyond session, days needed to continue his work in the General Assembly. [Bell] had an agreement that he would take unpaid days off while the General Assembly was in session. He also took another seven unpaid days off this year, after the session ended, to do other legislative matters. Bell says that was part of the agreement but now the school board says he cannot take those extra days next year. After trying to resolve the issue for the past two months, Del. Bell has now handed in his letter of resignation to the school superintendent and will no longer teach special education in the Augusta County schools. 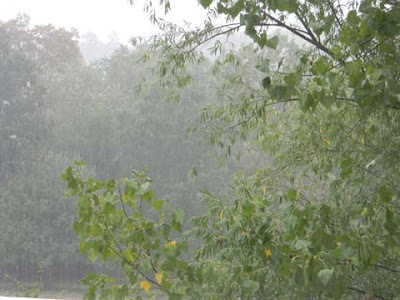 The coffee plantation trip had seemed like a really good idea on Saturday. That is, of course, before I'd been told we had to be on the bus by 6:30. In the morning. So when my alarm went off at 5:30 am the next day, I was not a happy teenager. It's hard to get excited at such an early hour, no matter how much free coffee one is promised. But I'd made a sacred pact to my coffee-addicted mother that I'd bring back some Costa Rican café, so no matter what I had to make that bus. Once at the plantation - fortified with coffee and encouraged by the first real sunshine since being in Costa Rica - my mood had definitely picked up. For one, the countryside is absolutely breathtaking. Hilly and in lush shades of green, it was hard to decided what to look at during the bus ride. Acres and acres of land were covered exclusively by coffee plants. Enough to last my mother a week. And so it's no surprise Costa Rica supplies 3 percent of the world's coffee. Though this is a small percentage as compared to Brazil (32%) and Colombia (12%), the tour guide declared that Costa Rica is more about quality than quantity. As a result prices are a bit higher and therefore not as popular with big name coffee companies (Starbucks uses a LOT of Costa Rican coffee in their blends...a LOT). Despite this, many coffees may be 10% Costa Rican beans and the rest would be cheaper beans. We received a tour of the facilities, learning about the process of sorting, drying and roasting. The growing season runs through the end of the year and beans grow at individual times, so a busy could have beans ready by September and other ready by December. Having just seen the process the coffee went through and tasted the samples of the coffee roasts, I'd decided on the Peaberry AA roast for my mother. As they explained it, Peaberry AA is made from mutated beans. Though normally a coffee bean as two halves, in the Peaberry blend the beans are just one bean without having halves. This has a sweeter, purer taste - a high quality coffee. For myself, I decided on organic, which was a darker roast. Plus some chocolate covered expresso beans. What can I say? I've got a sweet tooth. With my new knowledge and beans in tow, I left a very happy teenager. Beats sleeping in anywday! •In one act, the Obama administration has signed the pink slips of tens of thousands of Louisiana and Gulf Coast citizens. •The financial consequences from the moratorium will eventually create an economic ripple effect that will negatively impact every citizen of the United States. •Consumers will bare the brunt of the federal drilling moratorium paying more everywhere from the pump to the grocery store. Gov. Jindal summed it up when he said, "We're in the middle of a war to defend our way of life." The World Cup vuvuzelas are back! The World Cup soccer games are over ... but just when you thought the vuvuzelas were gone, they're baaack! I was visiting a friend when I heard them ... that annoying sound of angry hornets humming in the background. I turned and looked over my shoulder where my friend's kids were playing the 2010 FIFA World Cup South Africa EA Sports Nintendo Wii game in the next room. If you remember, the vuvuzelas, those three-foot-long plastic trumpet-shaped horns, stirred up controversy during the recent World Cup with numerous complaints of the constant droning sound. At the time, the team from Siberia felt it has lost a match because they could not hear their fans. Other teams complained they could not hear their coaches. Fans around the world muted their television sets and the internet was a-buzz with opinions and "ban the vuvuzela" polls. For those of you who loved the sound of vuvuzelas, you can still get your fill through the Wii game. For the rest of us, there is a "turn off vuvuzela" option. You heard me right. Go to "menu option -- click vuvuzelas off." Voila! No more vuvuzelas! This option will still allow you to enjoy the cheering crowds and commentary from the announcers without the annoying buzz. Wouldn't it have been nice to have had this option during the real World Cup games? Gov. McDonnell kicks off "Choose the Commonwealth!" In December of 2004, at the annual Republican Advance held in western Virginia, candidate Bob McDonnell was running for the Party's nomination for Attorney General. Keeping with tradition, he was set to host a hospitality suite that would see hundreds pass through during the two-day event. The theme of the hospitality suite was to showcase Virginia-made products from throughout the Commonwealth including Staunton-made Curry's Kitch'n Cook'd potato chips carried to the event fresh from the factory. Last week Governor Bob McDonnell proved he was still interested in spotlighting Virginia-made products with the promotion of the "Choose the Commonwealth!" campaign that encouraged Virginia businesses and trade groups to "incorporate Virginia food and beverage products in day-to-day business operations." “Virginia is known far and wide for our high quality food and beverage products, and Virginia’s top-tier wines are gaining well-deserved recognition from wine connoisseurs around the globe. "Plus, the 'Virginia Finest' and 'Virginia Grown' programs help consumers and retailers know that when they’re buying Virginia agricultural products with those labels, they’re buying the very best the Commonwealth has to offer. ... I am constantly incorporating Virginia’s best known products, including ham, seafood, peanuts, and wine." Agriculture is Virginia’s top industry, contributing $55 billion and more than 350,000 jobs to the economy each year. Many businesses in historic downtown Staunton, located in the central Shenandoah Valley, use products from throughout the Commonwealth. Restaurants such as The Depot Grille, Staunton Grocery, Zinandoah, Mockingbird, and Cranberries purchase meats and poultry products from nearby Polyface Farm, wines from area vineyards, and bottled water from Shenandoah Water Company as well as other local products. Virginia Accents on Beverley Street features high quality Heart Scents candles crafted by an Augusta County family. Coffee on the Corner, which can be found near the Blackfriars Theater, uses locally-processed coffee. Berry's Natural Way, a vitamin supplement store on Beverley Street, makes it a point to support local businesses such as Seawright Springs water from neighboring Augusta County, Mennonite homemade bread, honey from nearby Sanger's Glen, Bees Works lip balm from Chantilly, and Virginia Soaps and Scents from a Suffolk home school family. Staunton native and Berry's Natural Way manager Alex Davis said the store owners actively work to support local producers, and people from the community go to them looking for those products. Tourists, who make up a big part of business especially during the summer, specifically shop for local products. Staunton's weekly farmers market, held downtown on Saturday mornings, offers some of Virginia's finest in fresh vegetables, fruits, meats, plants, flowers, baked goods, herbs, and other offerings from area farmers. The "Choose the Commonwealth!" campaign and the Governor encouraged businesses to contact the Secretary of Agriculture and Forestry, Todd Haymore, and notify him of commitments made to buy Virginia grown and produced food and beverage products. The latest Survey USA poll of the VA 5th Congressional District race has Republican Robert Hurt at 58% ... and Democrat Tom Perriello at 35%. More at The Washington Examiner. Campaigning in 2009 as "Bob's for Jobs," Republican Bob McDonnell won an historic gubernatorial election in Virginia when he pulled two-thirds of the votes to lead a three-way sweep of the top offices. Since that time he has kept his word, partnering with Lt. Gov. Bill Bolling to court companies and businesses, bringing 71,000 new jobs to the Commonwealth in the six months since taking office. That is the third highest job creation in the nation. Fortune 100 company Northrop Grumman's decision to move their corporate headquarters from Los Angeles to Northern Virginia, bringing 300 jobs, came three months into the McDonnell administration. In addition to new jobs, the Governor worked with the General Assembly to turn around a $2 billion budget deficit left behind by Democratic Governor Tim Kaine into a $220 million surplus at a time when states such as California and New York were on the verge of bankruptcy. job new Governor Bob McDonnell is doing, according to a new Rasmussen Reports telephone survey in the state. That includes 29% who Strongly Approve." With his professional manner and military background, Bob McDonnell may be a rising star on the national scene, often used as an example of conservative leadership. Virginia Gov. Bob McDonnell rallied House Republicans for the midterm campaign in a meeting at the Capitol Hill Club Tuesday, likening his 2009 election as governor to the 1993 GOP wins in Virginia and New Jersey that presaged the 1994 GOP wave election. “The election is always about independent voters. What they care about is jobs, taxes, spending and federal intrusion,” he said. In January the newly elected governor was chosen to respond on national television to President Barack Obama's State of the Union address. With continued high approval ratings, look for Bob McDonnell to continue to be a driving force with Republicans. 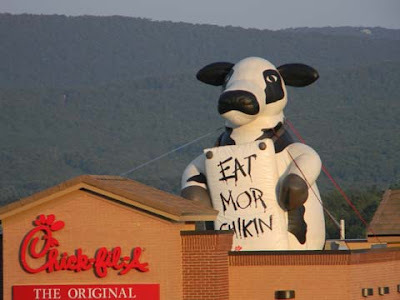 July 15, 2010 ... with the Blue Ridge Mountains as a back drop, the Chick-fil-A trademark cow alerts all that the newest Virginia location is now open in the central Shenandoah Valley city of Waynesboro. 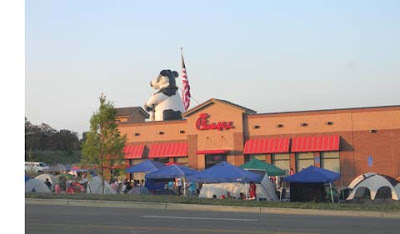 As part of the opening, 100 guests camped out in the parking lot for 24 hours prior to the official opening. Chick-fil-A is located in front of Target at Exit 94 off Interstate 64. Breaking ... Shirley Sherrod of the USDA has resigned after comments made at an NAACP banquet. This comes after the NAACP issued a statement last week accusing tea party members of being racist. Andrew Breitbart at BigGovernment.com broke the shocking video of Shirley Sherrod, USDA Rural Development Georgia State Director, where her comments indicated race played into her professional decisions at the USDA. In the video, Sherrod also spoke of referring the white farmer to a white lawyer, thinking the latter would be more sympathetic because of race. "So I took him to a white lawyer that had attended some of training that we had provided because Chapter 12 bankruptcy had just been enacted for the family farm. So I figured if I take him to one of them, that his own kind would take care of him." Tonight Fox News is talking about the resignation and the fact it took the new media in the form of Andrew Breitbart to expose this video and its implications. Apparently the banquet took place in March 2010 ... will this explosive story make the rounds of the mainstream media now? Update: More news on this story from The Other McCain. The SWAC bloggers are sporting a new look. Yankee Phil has joined Fishersville Mike and SWAC Girl in sporting a facelift ... a new look ... for the blogs. I like it. We're moving the furniture around ... knocking out some windows and doors ... adding new paint and carpet. LOL. George Allen, author of “What Washington Can Learn from the World of Sports”, will appear live on “Live and Local” on Harrisonburg’s WSVA 550-AM at 11:30 am ET this morning. Please tune in or go to www.wsvaonline.com to listen live. Earlier this month I had the invaluable opportunity to travel to Israel as part of a Congressional delegation. The delegation met with a variety of Israeli and Palestinian government leaders to discuss issues related to the ongoing violence in the region and efforts to further the peace process. Arab-Israeli conflict has marked practically every decade since the founding of Israel and numerous attempts at the peace process have failed. During my visit, which was organized by the American Israel Education Foundation, I saw firsthand the challenges that face Israel, challenges that are often shared by the United States. Protecting Israel, much like the United States, against global terrorism, is a vigilant effort. With every attack in the Middle East, it only emphasizes the fact that we need to remain vigilant in our war against global terrorism. The delegation traveled to Jerusalem where we met with Benjamin Netanyahu, the Prime Minister of Israel. At the meeting with Prime Minister Netanyahu, we discussed the future of the peace process and negotiations with the Palestinian National Authority. Prime Minister Netanyahu has been calling for direct negotiations with the Palestinians for the past fifteen months. For peace talks to be successful all issues, including the economic and security arrangements for an independent Palestinian nation and recognition of the right of Israel to exist in peace without threat of terrorist or other attacks emanating from a new Palestine, must be decided as part of these negotiations. The delegation also met with Salam Fayyad, the Prime Minister of the Palestinian National Authority, with whom we specifically raised this issue, reminding the Prime Minister that direct negotiations are key to a real and lasting peace in the region and the future economic prosperity of the Palestinian people. Additionally, during our meeting Israeli Prime Minister Netanyahu expressed his concerns regarding Iran and their stated goal of destroying the state of Israel. Prime Minister Netanyahu stressed the importance of expanded sanctions against Iran. An Iranian government in possession of nuclear weapons would be intolerable for most of its Middle East neighbors and the rest of the world as they are already the sponsor of most of the terrorist attacks out of Gaza and Lebanon and thus the biggest obstacle to peace in the Middle East. For this reason the Congress recently passed, with my support, and President Obama signed into law the Comprehensive Iran Sanctions, Accountability and Divestment Act. This legislation significantly strengthens the sanctions against Iran in an effort to restrict their illegal nuclear activities. Prime Minister Netanyahu expressed his strong support for this legislation and spoke of the vital role it will play in promoting peace in the Middle East. The Middle East is an area rich in a history marked by long-standing hatreds and disputed land claims. While the quest for peace is daunting, we must remain steadfast in our pursuit, for we have a vested interest in trying to stop the terrorist violence that occurs daily in Israel, the West Bank, and the Gaza Strip. When Governor McDonnell and I took office in January, we set two key goals for our first year in office: 1) Getting Virginia's economy moving again and creating jobs for Virginia's families, and 2) Eliminating the $4.2B budget shortfall we inherited and turning our budget shortfalls into surpluses again. We used incentives to encourage state agencies to save money, rather than spend their entire budget in the final months of the fiscal year, and we are beginning to see the positive effects of economic growth in Virginia. For example, $18M will be directed to Virginia's public schools; approximately $20M will be dedicated to the Transportation Trust Fund; $22M will go to the water Quality Improvement Fund; and $82M will be used to provide a 3% bonus for state employees, who have not received a pay raise in three years. On Thursday, Governor McDonnell and I gave an update on our efforts to get Virginia's economy moving again and create jobs for Virginia's families. Fortunately, it was more good news. These results show what conservative leadership can do and how government can work for the people when it adheres to sound principles. Wouldn't it be great if we could get our friends in Washington to take a page from the Virginia playbook? Sip wine and stroll the world-renown gardens of horticulturist, author, and lecturer Andre Viette at this weekend's 14th annual Daylily and Wine Festival. With the picturesque Blue Ridge Mountains in the background, the festival has been a long-time summer tradition in the central Shenandoah Valley, showcasing the Viettes' extensive gardens as well as some of Virginia's finest vineyards. Two days of music, wine and beer tastings, seminars, workshops, gourmet food from area restaurants, a variety of artisans and crafters, children's activities, live radio coverage from Mr. Viette's garden, and much more will continue today from noon-5. The weather forecast is for hot and sunny. Mr. Viette offers over 3,000 varieties of perennial plans in acres of gardens at his home and nursery. The fields of blooming daylilies at this time of year entice artists to set up easels and capture the beauty. A beloved member of the area, Mr. Viette has contributed to the community in many ways over the years, teaching horticultural courses for almost 30 years at Blue Ridge Community College as well as hosting his radio show, "In The Garden," that is heard in four states and the District of Columbia every Saturday morning. He has opened his gardens to various fund raisers over the years including the annual Daylily and Wine Festival. If you want to attend, the festival will take place today at Andre Viette's Farm and Nursery located just minutes off I-64 and I-81 in Fishersville, Va. More information can be found at the Daylily & Wine Festival website. It's been four years since SWAC Girl joined the Virginia political blogosphere and during that time I've not done much with the site. But, like rearranging the furniture, it's time for a change ... new color, new header, new layout. I'm still working on it ... there will probably be some kinks that need to be worked out and the final layout may not be the final layout. I'm interested in feedback ... some have already given the thumbs-up while others are trying to get used to it. The website LynnRMitchell.com automatically directs readers to SWAC Girl. Just think of it as, "Changes in latitude ... changes in attitude." Weddings, birthdays, graduations, births, funerals ... life is moving on. All those memories and more flooded over me earlier this week as I paused in the middle of a busy life to reflect on what has been a good and a continually changing life. When a door closes, a window opens and that has certainly been true for me as I leap at the opportunity to learn new skills and plow ahead with life. And to think all those rambling thoughts and memories came from three encounters with three who knew me when I was a kid. Can you just imagine if I caught up with many of the other 500 fellow graduates? I could be daydreaming for weeks! Two days of music, wine and beer tastings, seminars, workshops, gourmet food from area restaurants, a variety of artisans and crafters, children's activities, live radio coverage from Mr. Viette's garden, and much more are planned from 9-5 on Saturday and noon-5 on Sunday. The weather forecast is for hot and sunny, perfect for a weekend of fun. If you want to attend, the festival will take place today and tomorrow, July 17 & 18, at Andre Viette's Farm and Nursery located just minutes off I-64 and I-81 in Fishersville, Va. More information can be found at the Daylily & Wine Festival website. The word started circulating around Staunton two weeks ago that the popular Dining Room Restaurant in downtown Staunton would be closing on July 16. Yesterday was its last day of operation and, reportedly, the owners are planning to move back to their native Virginia Beach. Although I never ate dinner there, it was a great spot for lunch with friends. My favorite was the chicken salad croissant, and their creme brulee was decadant. Word is that a new restaurant is planning to open in the former Pullman Restaurant location at the Staunton train station. Whatever happens, there are still plenty of places to eat around town from a quick bite to elegance tailored to fit any price range. Enjoyed lunch yesterday at Byers Street Bistro in Staunton's downtown Wharf area as they continue to offer a nice cool area indoors on a hot summer day in the upper 90s although there were patrons outside on the patio. WaEx Editorial: "Holder should drop the Arizona Suit"
Virginia is now the most recent of nine states to unite in opposition to Attorney General Eric Holder's politically charged suit against Arizona's recently enacted immigration law. Don't be surprised if more states join the Arizona cause because Holder is now adding insult to injury by threatening a second suit against Arizona. This one would charge Arizona with racial profiling if the federal courts allow the state's statute to go into effect as scheduled on July 29. From Iran to U.S. and back to Iran. Dead man walking? Tuesday afternoon a flurry of emails circulated the Virginia blogosphere with the question: "What's happened to Blog Net News?" I had been busy that day and was not aware it was down until reading the emails. A quick check confirmed that it was gone ... but was it temporary or permanent? Apparently someone had been in contact with Dave Mastio, owner of BNN, and indicated it would not be back anytime soon. BNN's blogger headlines have been a part of the Virginia blogosphere for almost four years. Suddenly, the window into a community of fellow bloggers was darkened. Until (if?) BNN gets up and going again, the Old Dominion Blogs aggregator hosted by Virginia Right! blogger Tom White is taking up the slack. ODB has been in place for about a month so now it's just a matter of getting the word out. Old Dominion Blogs aggregator ... the headlines are back. Thanks, Tom. Update: Dave Mastio, BNN owner, posted on Facebook that BNN was gone apparently because of the dismal financial atmosphere. My thanks to Dave for a service many appreciated throughout the years. "Saw you in the parade...."
George W. Bush's book "Decision Points"
Is Twitter a fad ... or is it here to stay? Will GOP governors dominate in 2010? Hot, dry weather good for the bubbly?